Recently, Rodrigo Calloni mentioned to me that he wanted to create a visualization for the upcoming 2018 FIFA World Cup. 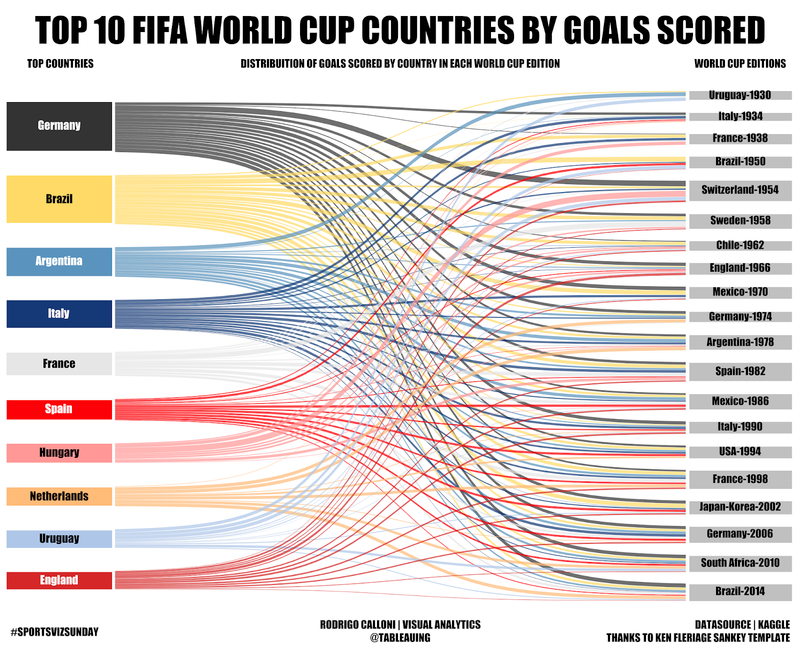 His idea was to create a sankey diagram showing the top 10 countries and the number of goals scored in each World Cup. But he hadn’t previously created a sankey and wondered if I could help. 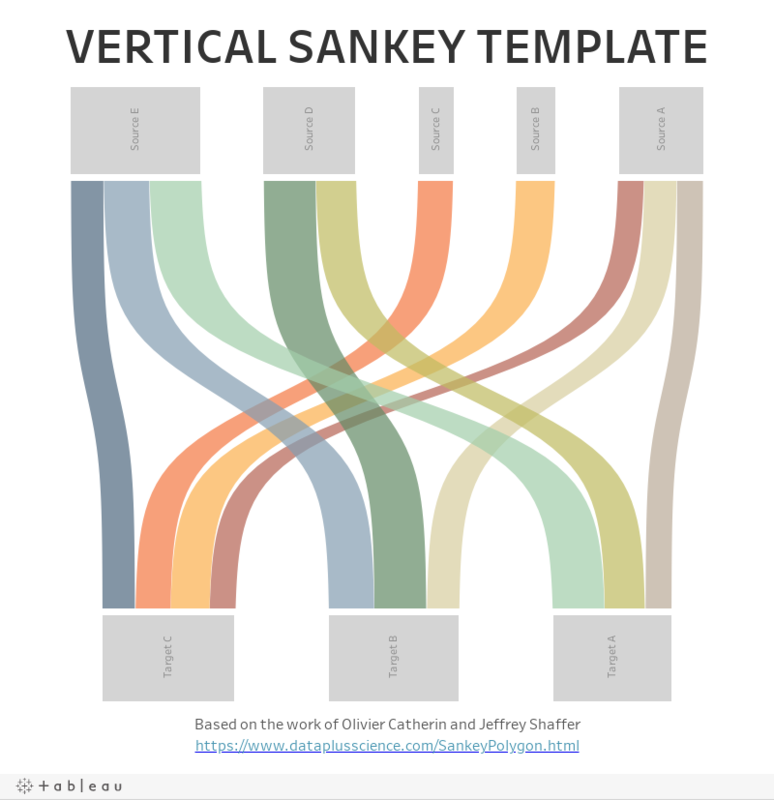 Fortunately, I had previously built a nice template for sankeys from the work by Olivier Catherin and Jeffrey Shaffer which I provided to him and resulted in the following visualization (click on the image to see the interactive version). Unfortunately, some chart types, including sankeys, can pretty difficult to create, even when you have a detailed tutorial. They tend to include data scaffolding, data densification, unorthodox joins, table calculations, trigonometry, etc. So when I create one of these, I always templatize them as much as possible. 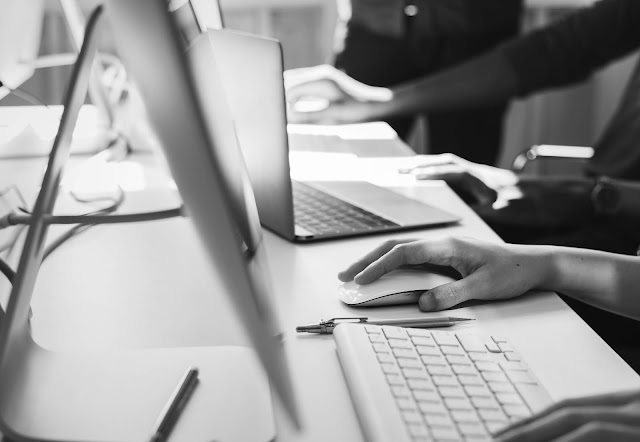 These templates typically consist of a relatively simple Excel spreadsheet into which some data can be plugged and a Tableau workbook, which simply connects to the spreadsheet. In the end, the process becomes relatively plug-and-play. The complexity of these charts can often be a deterrent for some people. So, in this series of blog posts, I’ll be sharing some Excel/Tableau templates for creating three different charts—Sankeys, Sunbursts, and Joy Plots. In each post, I’ll start by describing the chart, detailing its potential use cases, and providing a high-level technical description of how it’s built in Tableau. I’ll then provide as step-by-step tutorial on how to use my templates. Before I move onto my first chart type, I want to take a moment to encourage you to drill into these chart types further. Part of the reason I am providing these templates is in hope that it will pique your interest in better understanding how they’re built. Taking apart complex charts is a really good way to learn some of the more advanced features of Tableau, so I highly encourage you to take some time to understand how these work under the covers. We’re going to start with sankey diagrams. Datavizcatalogue.com describes these as such: “Sankey Diagrams display flows and their quantities in proportion to one another. The width of the arrows or lines are used to show their magnitude, so the bigger the arrow [or line], the larger the quantity of flow.” These charts are named after Matthew Henry Phineas Riall Sankey (that's a lot of names!!) 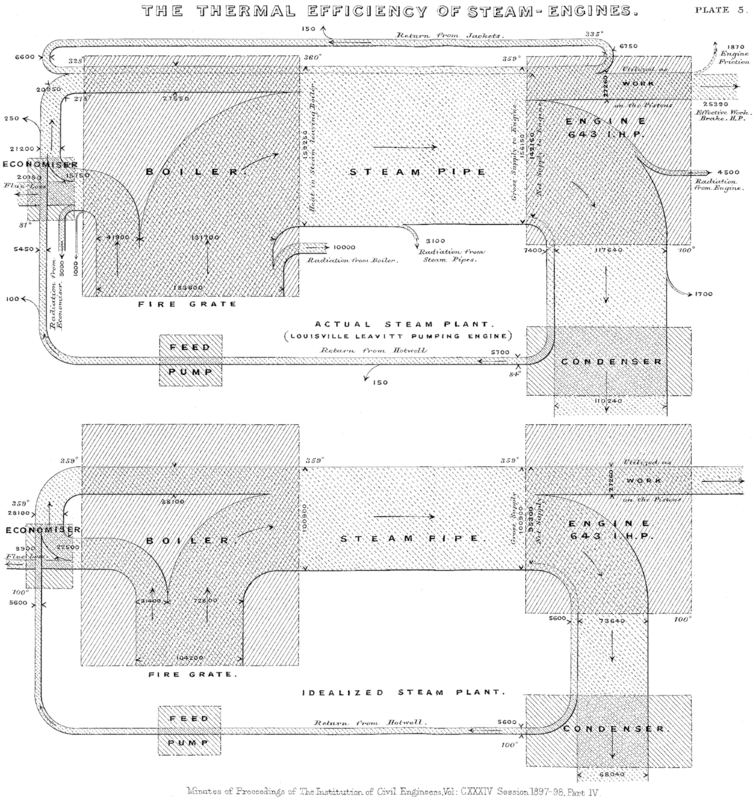 who first used this chart type to show energy efficiency of a steam engine as shown below. (Wikipedia). So, the key use case for sankeys is for showing flow from one thing to another. One of the best use cases I’ve seen is colleges using sankeys to show graduating students’ majors and the proportion of those students who have gone into various professions. Unfortunately, sankeys are often misused in situations where there would be a much better alternative. Sure, sankeys look cool, but it simply isn’t always the best chart type. So, before I go any further, I just want to stress the importance of considering the best chart for your use case before using a sankey. Most of the time, a sankey will not be the best chart and that, in all honesty, is a really good thing because your better choices are most likely going to be much easier to create. 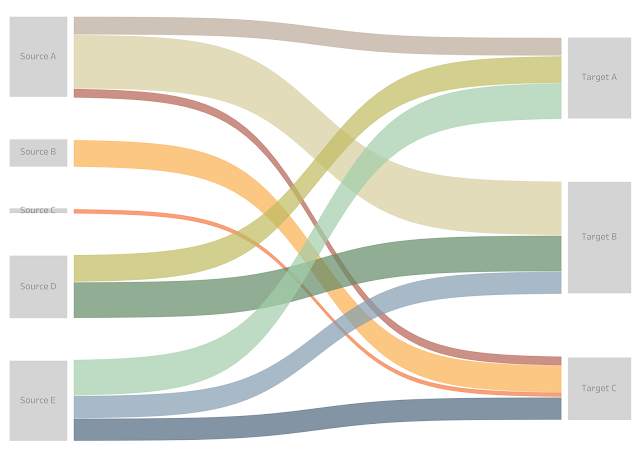 A number of different people have implemented sankey charts in Tableau. Some approaches consist of lines drawn from one point to another, but the one I’ll be discussing is the polygon sankey developed by Olivier Catherin and Jeffrey Shaffer. Since this method was developed, it’s become one of the most commonly used methods. The chart consists of three primary components. The first two are gantt bars which represent the source and target (from and to). The third is a set of polygons, sized by proportion, which show the flow from one thing to the next. These polygons tend to take the shape of a sigmoid curve—a type of curve which takes on an S-like shape—which are created by leveraging parametric equations. Building these polygons also requires data scaffolding and some complex table calculations, which I won’t go into here. Before I share my template, I quickly want to mention the amazing work that Ian Baldwin, of the Information Lab, recently did which shows how to build a Sankey diagram in Tableau without any data prep beforehand. It's a brilliant post and well worth the read. This sankey template is based directly on the method detailed by Olivier Catherin—I have not added any new innovations to the method. Rather, I’ve simply tried to turn it into a plug-and-play template. So, all the credit for this work goes directly to Olivier and Jeffrey. I'd also be remiss if I didn't credit my colleagues at Bucknell University. I first came to understand the inner workings of this chart about a year ago when I took apart some of the sankeys used internally. The template includes two components—an Excel spreadsheet and a Tableau workbook. The goal in developing these templates was to make it as easy as possible to plug in your own data. That being said, it does make certain assumptions. Primarily, it assumes that you already have aggregated your data. Modifying the template to allow for non-aggregated data would not necessarily be difficult, but I won’t be dealing with that here. Link – The purpose of this column is simply to join each row in the Model worksheet to each row in Data worksheet for the purpose of creating the polygon curves. But don’t worry too much about this. You simply need to make sure that every row has a value of “link” in this column. Note: Strictly speaking, we could use a join calculation in Tableau to join these sheets together, but for simplicity sake, I often like to include a separate column in my data set. Step 1 – This column defines the starting point of the flow (i.e. the “from”). So, to use my example of college graduates, this would be student majors. Step 2 – This column defines the end point of the flow (i.e. the “To”). This would be the college graduates’ professions. Size – This column contains the aggregated value for the flow. Again using the college student example, this would be the total number of students that majored in one subject (for example, Chemistry) and ended up working in a particular field (for example, Food & Drug). Once you have populated the Data sheet, then you need to connect it to Tableau. Start by downloading the template Tableau workbooks, which are on my Tableau Public page. I’ve actually created two Tableau workbooks—one for horizontal sankeys and one for vertical sankeys. Then edit the data source and connect it to your Excel template. The workbook should update automatically to reflect your data. From here, you can do whatever you like with the chart—change the colors, add filters, update tooltips, etc. just as you normally would. Here’s how it looks with the sample data shown above. And that’s all there is to it. If you use this template to create your own sankey, I’d love to see it. But please don’t create one simply because you can. Be sure to closely scrutinize your use case and make sure it’s the right chart type first. Update April 14, 2019: I've just posted a set of six new variations of this sankey template. For more, check out the post: More Sankey Templates: Multi-Level, Traceable, Gradient, and More!! I can't open the twbx file in Tableau 10.2. Do you have an idea to help me please? Thank you for this! Is there a way to add another flow to this diagram? I was able to get a sheet for the 3rd bar working but not for a second curve. Any help would be much appreciated! Yes, but you'd have to duplicate all of the calculated fields used to create the curve. If I am to understand this correctly - one would need to duplicate the calculated fields. Is recreating the bars (bar3, bar4, bar5,... ) also necessary? Yes, unfortunately, you'd need to duplicate just about all of it. Not a problem. Would I be able to email you the work I am doing to confirm I am on the correct path? Looking forward to utilize this template!! Thank you so much for this! I was able to show pre and post merger account locations very easily with this tool! Great. Glad to hear it! When I load my data in, t(Model) is colored red, which makes Sigmoid invalid, along with 5 other dependencies on Sigmoid. Path(Model) is also marked red and says it cannot be found in the database, the same as t(Model). How can I fix this issue? Path(Model) is also marked red and says it cannot be found in the database, the same as t(Model). Hi Ken, thanks for your response. I ended up having to right click on t(Model) and use Replace References and then did that for the Curve A Polygon as well, I think. I can't remember, but I was able to get it to work somehow. 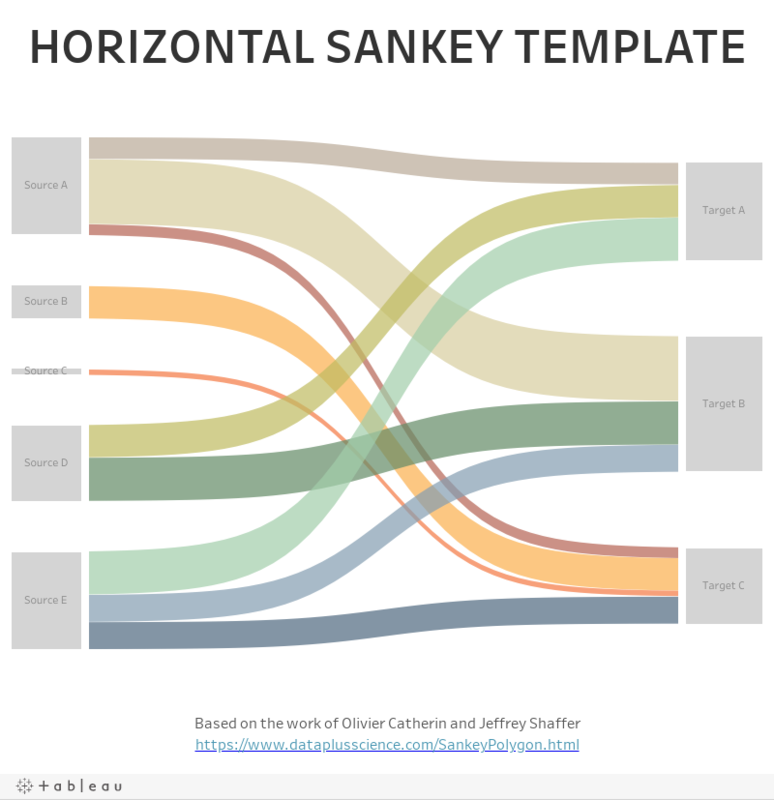 Alternatively, I downloaded the horizontal Sankey template again and made a separate Excel file to load in. This time there was no need for any weird fixing. It worked perfectly. I must have done something wrong the first time. Thank you so much for your response and this awesome template! It could not be any more convenient and does exactly everything I need, especially considering how I had no luck with any of the other tutorials I saw online. Great. Glad you figured it out! And glad you found this useful. This template was the most useful thing I've found yet when attempting to create a simple Sankey flow chart. I haven't got it working quite the way I want yet, but I have a very rough prototype that I can show to stakeholders to get their buy-in for more development work to be done. Thank you very much for posting these templates! Just let you know that your templates are not working now (tableau 2019.1) - something to do with extract??? Thanks for supplying updated templates. Ken, this article seems to be interesting but I did follow your advice by checking that informationlab article thingy. It's flawed as First step 9 seems to work but STep 10 is not working and is not producing sankey chart. Rather, it is just producing stacked bar charts. Do you know why or how? I would love to know why or how so I can progress to your article as your article is a bit advanced for me to learn first unless I try with informationlab and see how they tackle it before I take your version. Thanks for advice. Hi Ken, how can i change your tableau horizontal template from polygon to just lines? I am basically looking to create a multi level decision tree and so i am not really bothered about the flow size...Will really appreciate your inputs on this..
Hmmm, that's a tricky question. I'd probably need to know more about what you're trying to do. Any chance you could email me at flerlagekr@gmail.com? This is great- thank you! I was able to create a horizontal Sankey with one issue: the text in my "target" column is not displaying, no matter how large I make the display area. It is completely grey. Do you know what might be causing this? My colleague sent me this link and it seems your approach is an great starting point to learn Sankey. The table "[TableauTemp]. [Mode]$" does not exist. Were you able to get it working then? If you'd like, I could downgrade it to a previous version. Could you email me at flerlagekr@gmail.com?